So Neil was overjoyed to the point of tearing up about Alan Moore and Melinda Gebbie figuring on the National Portrait Gallery’s picture of the month. A beautiful word, which I’m sure to keep in mind. While I was looking through a stack of postcards, this image from London’s Natural History Museum jumped out, so I’ll be using it today to write to a friend. The picture was taken by Malcolm Hey, is entitled “Reclining emperor shrimp” and won a Wildlife Photographer of the Year award in 2005. Twirling and whirling in a crimson leotard and white tutu, the Spanish dancer (a large nudibranch, or seaslug) emerges to feed at night. Sometimes it has a passive partner, an emperor shrimp, tucked in the frilly folds of its gills. 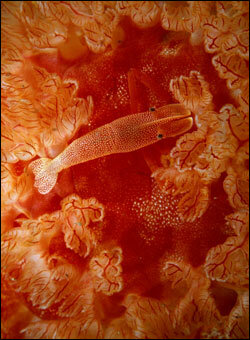 The tiny shrimp (about a centimetre – 0.4 inches long) turns red to blend in with its host’s costume. Nudibranch is a great word.